If you are a cat owner, then you will know how important it is to keep them occupied. This is even more so when you have an indoor cat who likely doesn’t receive as much exercise as an outdoor cat. Cat trees can be a perfect option for cats of all ages, as they provide a fun and engaging climbing frame for them to climb, chew, perch and jump on and most of all scratch. This saves your furniture from being attacked by your cat, especially kittens who are desperate for something to scratch almost all of the time. Purchasing a cat tree is an investment which is guaranteed to be worth it. However, with so many options on the market, it can often be difficult knowing what to look for. In this article we will take a look at what to consider when purchasing a cat tree, to give you a bit more information on what to look out for. We will then show you one of the top cat trees currently on the market – the Go Pet Club 72” cat tree. Cat trees can come in many different designs, styles and sizes. There are a number of things to consider before buying a cat tree. From tall to small, wooden, plastic, multiple cat, single cat, and multiple levels, there are so many factors to choose from. We cover some of the important things to look for below. You will find that most cat trees are designed with wood, corrugated cardboard, carpet or sisal. Sisal is a natural fiber which cats just love to scratch. Carpet is mostly used on the flat surfaces and provides a comfortable spot for them to rest. If you own a larger breed cat, then you may be wondering if there are even cat trees to suit your little friend. Well not to worry as there are! These are designed not only to support the extra weight but also to give them enough room to stretch out and relax just like any other cat. Perhaps you own more than one cat and would therefore like to find a tree which will support 3 or 4 cats at one time without any fear of the tree tipping over. Some cat trees come with an extra wall strap which can be attached to a wall in order to keep it steady. This means your 4-legged friends can all enjoy the tree without any worries of it collapsing. If you own an outdoor cat or your cat is often in the garden, then an outdoor cat tree may be a more suitable option to have. This will help them to feel more comfortable when outside and can give them a new place to relax closer to home. Outdoor cat trees can be either in pop-up material design, or a more stable wooden shelter design. This allows them to enjoy the outdoors even when the weather is bad! Maybe you own a cat who really enjoys climbing? Then a tall cat tree would be a great option and one which your cat would thank you for – if they could talk. 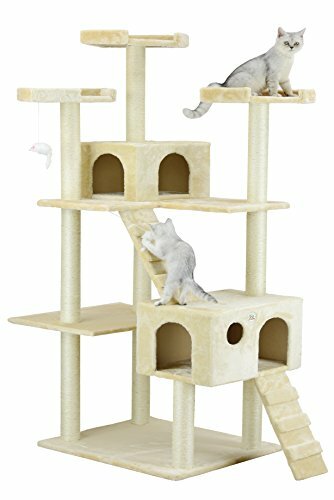 These types of cat trees offer various tiers and platforms which they can enjoy jumping up and down from and climbing around. This helps them to keep active and most of all in shape. This cat tree by Go Pet Club is a whopping 72” tall, giving your cat a good amount of space to enjoy and exercise with at the same time. This cat tree is certainly full of surprises and bound to keep your cat’s attention for a long time. We take a look at the Go Pet Club cat tree in more detail below. Go Pet Club make fantastic, and stylish cat trees which not only will make your cat happy, but also look quite nice in your living area. They are experts when it comes to pet supplies, and their cat trees are no exception. If your cat needs entertaining, then a cat tree from Go Pet Club is sure to cheer them up! Often when cat owners purchase cat trees and platforms their main fear is the stability as they don’t want their cat to fall and hurt themselves. With the Go Pet Club cat tree however, you can be guaranteed a safe and stable platform for your cat as it is designed with strong compressed wood and features an extremely strong base. Your cat will spend many hours occupied with this cat tree as it features more than one compartment for them to explore. This includes 2 little hideaway homes on separate levels, as well as 2 toy mice which can be scratched and played with. There is also higher up platforms which your cat can enjoy climbing and jumping, so there is always something to keep them active. Go Pet Club have also created a cat tree which is extremely easy to set up. The base board, condos and top 3 perches all have to be assembled, which can be done easily in a few minutes by following the step by step instructions and with tools included. Cat Trees can improve your cat’s well-being as they enjoy playing and climbing and most of all keeping occupied! They are definitely a product worth investing in especially if you want to save your furniture. We hope that this article has given you a bit of inspiration when it comes to looking for a new cat tree, and perhaps the Go Pet Club Cat tree can be a good purchase for your little friend!